Later, his experience as a para-educator working with special education students inspired him to return to school and get his bachelor’s degree at age 30. He was on track to get his master’s degree in teaching when his daughter was born, and that goal went on hold. 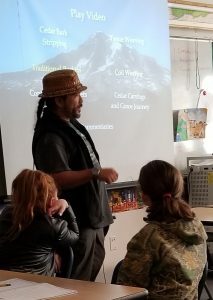 In the meantime, he worked with both the Skokomish Tribe and Squaxin Island Tribe doing drug and alcohol prevention programs, youth activities, and camps. And then there was coaching. Wherever he goes, Kallappa brings a passion for teaching kids how to play sports, including football, boys and girls basketball, and track. He co-founded the Inter-Tribal League (ITL), an organization that provides tribal youth in grades 3-12 with access to sports such as basketball, flag football, and soccer. Another key program: youth councils. He first became involved with the United National Indian Tribal Youth (UNITY) organization as a teenaged youth ambassador, doing outreach to other students. He has since helped to establish youth councils in Skokomish, Squaxin Island, and Nisqually. “They have constitutions, bylaws, and elected officers,” says Kallappa. 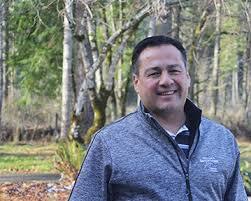 “We meet once a week and they go over their agenda.” Tribal leaders like Nisqually’s Willie Frank III support the students in an advisory capacity. After the Since Time Immemorial curriculum became mandated by state law, Kallappa and Nisqually tribal members developed a collaborative relationship with Yelm and North Thurston School Districts. “We did a professional development day for River Ridge High School staff about a month ago, and that was amazing,” Kallappa says. He, Franks III, tribal council member Hanford McCloud and his mother Joyce McCloud shared lessons on this cultural significance of the drum, treaties, and more recent history like the Boldt Decision and how it impacted fishing rights. He’s concerned that the current emphasis on standardized testing and increasingly demanding graduation requirements, particularly the idea of a final graduation exam, will sideline many already marginalized youth. “They’re the ones who are going to have a hard time with the test, when really they’ve already done a body of work that demonstrates enough to graduate from high school,” he says. 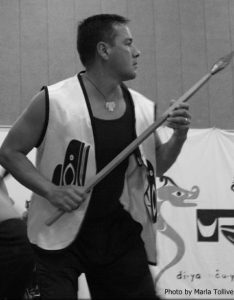 To learn more about the Nisqually Tribe, visit their website.